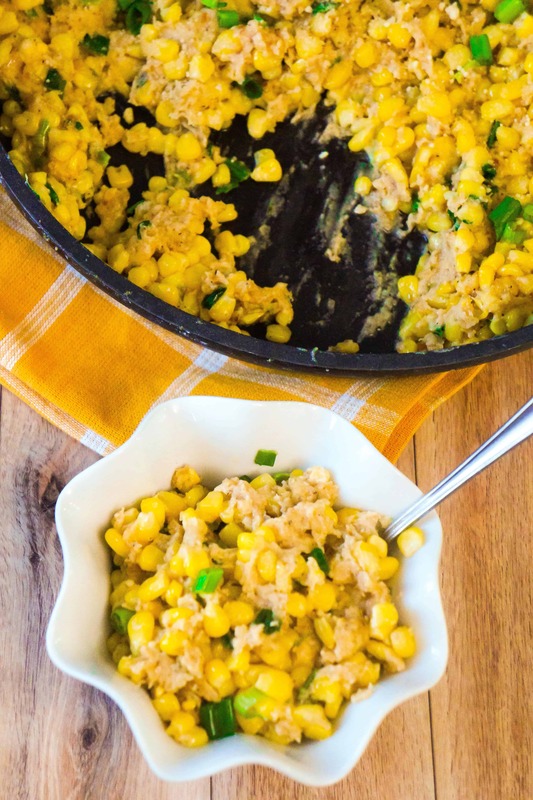 Cheesy Ritz Cracker Corn is a hearty side dish perfect for serving with almost any meal. 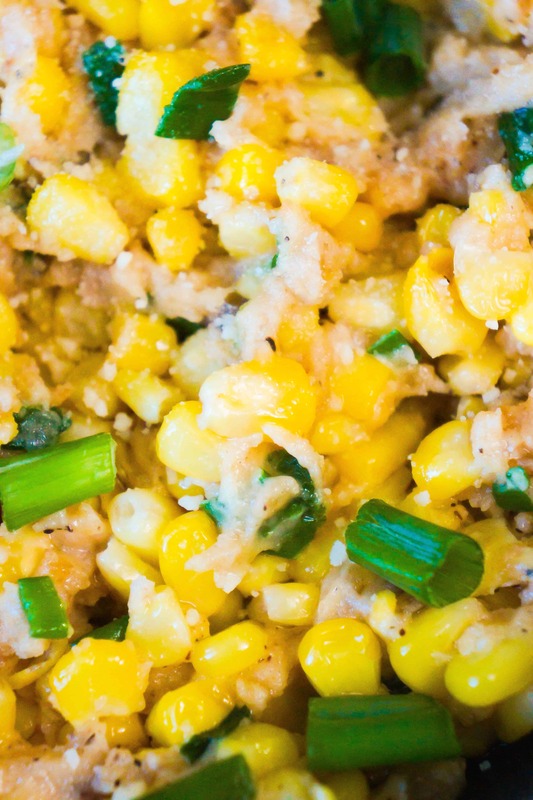 This easy corn dish is loaded with Ritz Cracker crumbs, Swiss cheese and Parmesan. 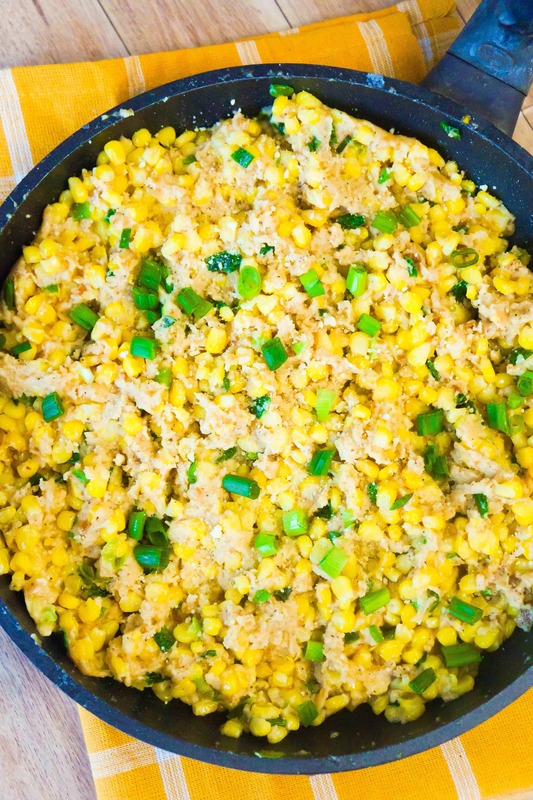 To make this corn side dish I started by cooking some frozen corn with butter. Then I crushed up some Ritz Crackers in a Ziploc bag using a rolling pin. I added the Ritz Cracker crumbs to the corn and stirred well. Then I added some grated Swiss cheese, Parmesan and 18% cream. I stirred the corn until the cheese was fully melted. It is important to stir the dish really well so that the cheese doesn’t clump to much. Then I added some chopped green onions. I used kitchen scissors to cut the green onions because I find it easier than using a knife to cut them. I stirred the dish well one more time before serving. This delicious side dish is bursting with flavour from the Ritz crackers and green onions. The Swiss cheese and Parmesan add a nice cheese taste that is not overwhelming. This Ritz Cracker corn would be the perfect side dish for a holiday meal like Christmas or Thanksgiving dinner. Be sure to try this Cheesy Ritz Cracker Corn the next time you are looking for an easy side dish packed with flavour. Another delicious side dish! 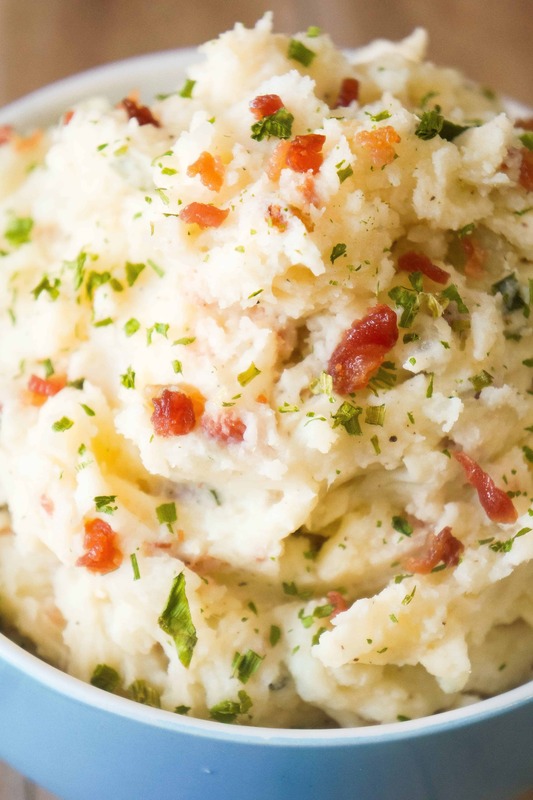 Check out these Bacon Cream Cheese Mashed Potatoes. Cheesy Ritz Cracker Corn is an easy side dish perfect for almost any meal. Serve this corn loaded with Swiss Cheese, Parmesan and Ritz Cracker crumbs with your Christmas or Thanksgiving dinner. Melt the butter in a large frying pan or saucepan over medium heat. 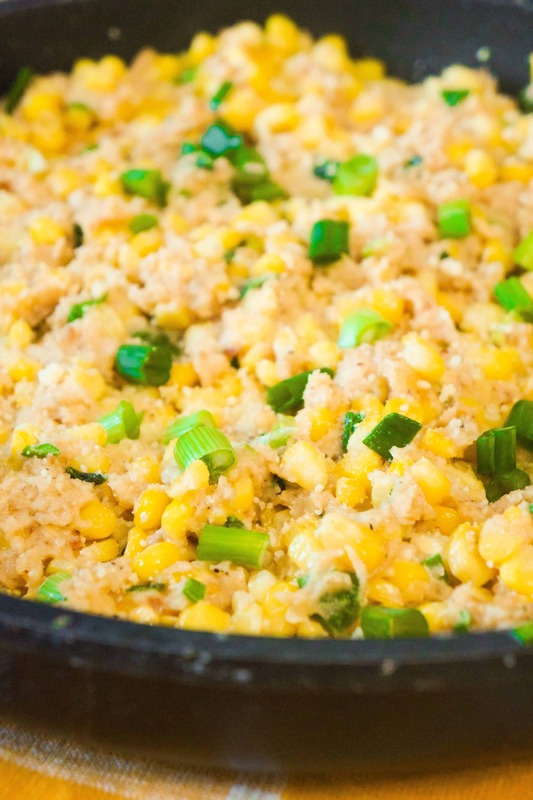 Once butter is melted add frozen corn to pan and allow to cook for about seven minutes stirring occasionally. Place the Ritz Crackers in a Ziploc bag and crush them until no large pieces remain. I used a rolling pin. Add the salt, pepper, minced onion and Ritz Cracker crumbs to the corn and stir well. Continue cooking for about 3 minutes and then add the Swiss, Parmesan and cream. Stir continuously until the cheese is completely melted. 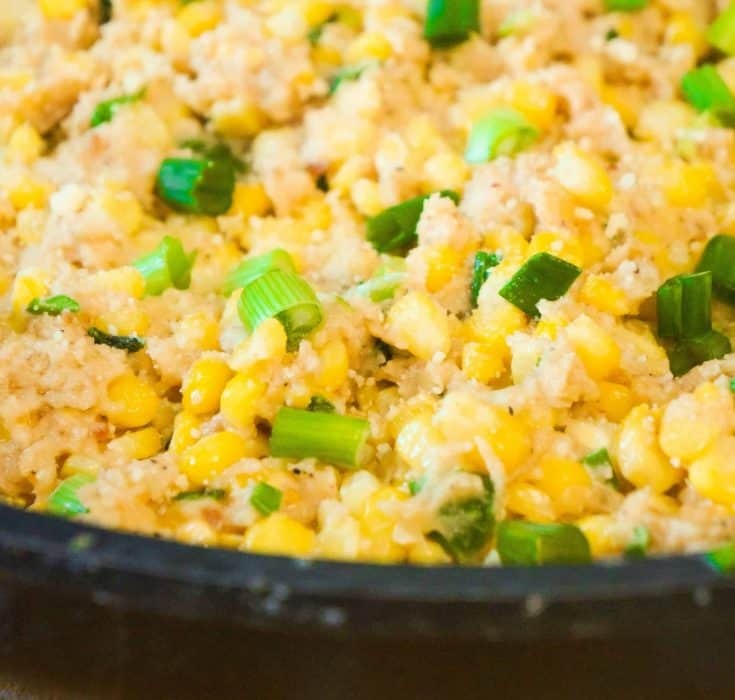 Add the chopped green onions to the corn and stir well again.